Whistle blows. Game over. World Cup over. USA goes home falling in the hands of the Black Stars… 2-1. Ghana. After losing 0-3 to Czech Republic in the opening game of the 2006 World Cup and soon-to-be champions Italy looming in the days to come, things looked rather grim for the Yanks. Yet, miraculously, the Americans were able to draw the Italians in their second match, and with the Ghanans taking care of the Czechs and losing to Italy, the stage was set for a win-or-go-home match between USA and Ghana. The Black Stars just needed a point to edge out the Czechs but the Americans needed all 3. Ghana struck early capitalizing on a defensive error, but Clint Dempsey responded with a thunderous strike off a brilliant cross from DeMarcus Beasley to bring the Americans back level in the 43rd minute. Yet, early in the second half, another defensive error by the Americans resulted in a penalty kick to Ghana which was effortlessly put in the back of the net. The Yanks did all they could but they had no answer for the Black Stars in the second half. Kevin Prince Boetang scored in just the 5th minute to put the Black Stars ahead in 2006. After tying the Brits (thanks to the infamous goalkeeping error) and Slovenia the Yanks were poised to the play Alegria in an all to familiar win-or-go-home match. The USA had 2 points after their first two matches and needed a win to jump Slovenia, who had beaten Alegria in their opening game and had 4 points. 4 years ago, the Americans were sent home in a similar win-or-go-home situation by the Black Stars, but this year they would not be denied. Landon Donavan would not be denied. Entering the 90th minute the score was tied and it seemed to be a 2006 repeat. Sent home early… But in 92nd Landon Donavan came through to save the Americans from elimination. Putting away a loose ball inside the 6 yard box to send the Yanks to play Ghana in the knockout stage. Their first appearance past group stage since 2002 when they reached the quaterfinals. Donovan, after scoring the go-ahead goal in the 92nd minute against Algeria. On June 26, 2010, the Americans stepped onto the pitch in Rustenberg, South Africa to play Ghana yet again, and Donavan and co. were determined not to repeat 2006. With the vuvuzelas roaring, the Ghanans struck first after a 30-yard run and a near post finish from Kevin Prince Boetang in only the 5th minute. Yet, again it was Donavan, the Savior of 2010, who answered with a masterful off-the-post PK finish after Dempsey was taken down in the 62nd minute. Despite chances from both sides, the game would remain scoreless and require extra time. Then, only 2 minutes into extra time, in front of 35,000 screaming fans, Asamoah Gyan would run onto a ball inside the US 18-yard box, absorb a blow from Bocenagrea, and pound the Jubulani ball over Tim Howard’s head and into the back of the net. American heads across the world hung as the Black Stars, again, crushed the Yanks’ World Cup dreams. Donavan, Howard, Dempsey and the Americans had done all they could but again… it wasn’t enough. Asomoah Gyan, after scoring the game winning goal against the US in 2010. In the past decade, the Ghanans have had our number- knocking us out of the World Cup, not once, but twice. 2-1 the result both times. Is this the year the Yanks overcome their kryptonite? Is this the year they finally put their past behind them? They face the Black Stars in their first game June 16 in Natal, Brazil and a win in their first game will be essential if they want a chance of advancing to the round of 16. This Ghanan team is similar to that of 2010 with goalscorer, and now captain, Asamoah Gyan as well as stars Essien and Boetang still on the roster. The Black Stars are an experienced squad coached by Ghanan, James Kwesi Appiah and determined to return to the round of 16 and beyond. They are strong, fast and skilled up front but are vulnerable in the defense and get caught out of position. Yet, despite a 6-0 thromping of Egypt to secure their spot in the World Cup at the end of 2013, Gyan and the rest of the Black Stars haven’t had much success in 2014. They scored just 5 goals in 6 matches in the African Nations Cup and Ghana has been held scoreless in their past four games versus Nigeria, Libya, Montenegro and Netherlands, respectively. The Black Stars are going through a scoring drought to say the least. In a tournament where momentum matters so much this does not bode well for Ghana and they will be looking for an encouraging result in their final match of the World Cup send-off series against Korea. On the other hand, other than an 0-2 loss to Ukraine in early March the Yanks have largely been in form in 2014. Yet, the Yanks defense is their biggest question mark. The starting centerbacks will likely be Omar Gonzalez and Matt Besler, neither of whom have any World Cup experience. Both Gonzalez and Besler have preformed well for the US during qualifiers but sometimes their inexperience shows and exposes holes in the defense that have been exploited. Michael Bradley and Dempsey have been shining for the USA recently and the Americans will need them to continue playing well if they are to advance. 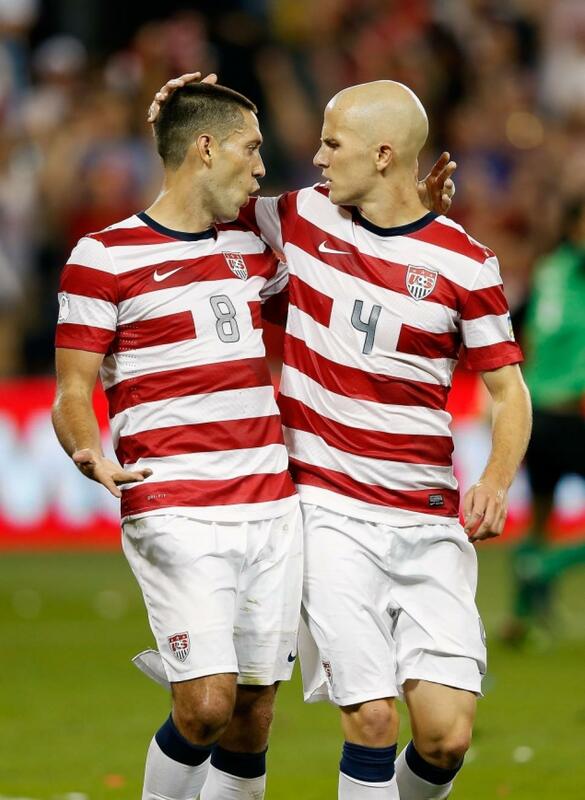 US stars, Dempsey and Bradley, will need to continue playing well if they are to advance to the knockout stage. Jozy Altidore may be the X-factor for the Yanks in this World Cup. After leading the Dutch side, AZ, with 22 goals in 2011 and performing well again in the subsequent season, the kid from New Jersey was bought by Sunderland in 2013. In the 2013-2014 season, Altidore only found the back of the net one time in a terribly disappointing season with the English club. Yet in 2013 for the US, Jozy scored 8 goals in 14 appearances including a hat-trick in the USA’s 4-3 come-from-behind victory over Bosnia and Herzegovia in August. Yet, Jozy has yet to find the back of the net in 2014 and this has many US Soccer fans questioning his confidence and ability. Yet, I believe in Jozy Altidore and I think it will be his performance against Ghana that will propel us to victory. Jozy may not have put the ball in the net recently but every game he is working as hard as any player on the pitch and putting himself in dangerous positions. He is making that extra run. He is making the right plays and he will be rewarded because this is the same player who scored in 5 consecutive games for the Yanks in 2013. Jozy knows we need him and he will step up. Altidore will be the key to the Yanks’ success against Ghana in Brazil. June 16, 2014, Natal, Brazil. Whistle blows. Game over.